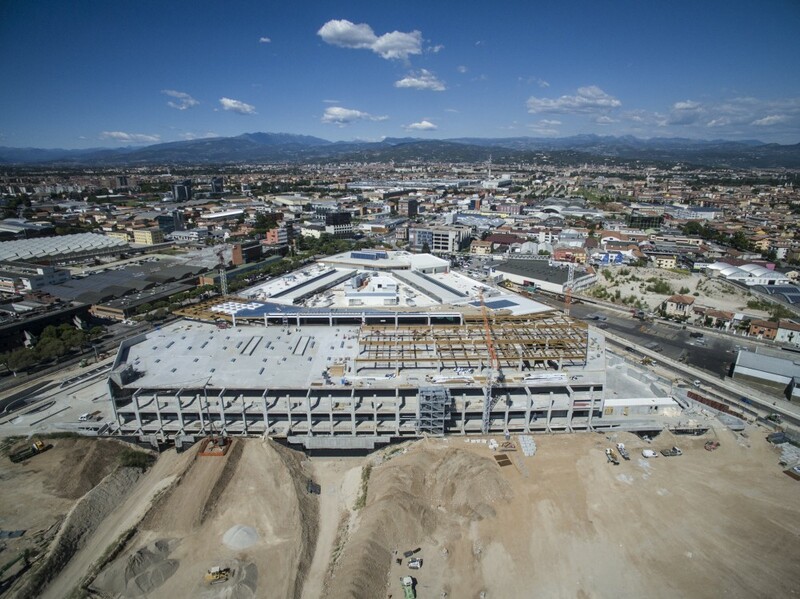 Bassano del Grappa, 18th October 2016: Built in the refurbished industrial site called Office Adige and being a part of the Adige City masterplan designed by Richard Rogers architect, the new Adigeo shopping centre has a total gross built area of 72,000 sqm and more than 140 shops. It will open in spring 2017. The building, composed of a prefabricated reinforced concrete structure and a plated wood roof, has a modern and flat aesthetic and a trapezoidal shape based on the structure of the plot on which it rises. The building comprises 3 floors above ground and 2 basements, dedicated to parking for a total of more than 2,500 car parks. The centre is located just 500 meters from the motorway exit, that is the main entrance to Verona city, and can be easily reached by 585,000 people living within half an hour drive. The key player of the project is ECE, that in April 2015 bought 100% of the project from CDS Holding. The company is the European leader in the retail real estate market with the management of more than 196 shopping centres in 14 different countries. In line with ECE social responsability policy, Adigeo is undergoing the LEED GOLD certification. To maximise the energy efficiency of the building, it has been essential to combine good shell insulation, highly performing glasses, with a good solar shield, and innovative M&E systems. In this respect, at Adigeo many sustainable and efficient choices were made, such us rain water recovery, white polyolefin roof to avoid hot islands, timers and snorkels installation in the taps for a water consumption reduction up to 20%. Furthermore, there’s a large use of renewable sources, such as a fotovoltaic field with a total power of 500kW, solar panels for sanitary hot water production and installation of air-source heat pump for the air conditioning of the mall. The HVAC system has been designed following the LEED prerequisites, with a strong focus on sustainability and energy efficiency. 16 WHISPER ENTHALPY air source roof top units by Climaveneta have been installed, for a total air flow of 500.000 m3/h, and 1 air to air reversible heat pump NECS-N/CA in Class A efficiency. Mr Zenucchi, the M&E designer says: «At Adigeo we have designed the M&E systems using state-of-the-art technologies now available on the market. The goal was to combine the most efficient performances of the building and the respect of the investor’s budget». Going in details, the HVAC system is divided into three different parts: the mall is air conditioned by high efficiency WHISPER roof top units, able to exploit the enthalpic rotary heat recovery for the pre-heating of the external fresh air and to recover the rejected heat for the air renewal getting very positive COP values. Furthermore, the highly energy-efficient plug-fan type, with backward blades, are directly coupled to the motor, meaning they boast intrinsic reliability and efficiency due to the absence of belts and related energy loss. Small shops are served by a mixed system based on air-air units and thermostatic loop. This grants high performances, above all in mid seasons because it takes advantage of the free-cooling effect between external and internal shops, with a very high seasonal average efficiency. The air renewal system is the same for all shops and is based on a heat pump working for the pre heating in winter time and for the pre cooling in summer period. Medium shops, with a surface of more than 400 sqm, are equipped with independent HVAC systems. To grant a perfect internal comfort, a great attention was paid to air distribution avoiding any air draft through the installation of high quality air diffusors, always trying to combine architectural, aesthetic and technical needs. To keep always the best air conditions, F7 and F8 high efficiency filtration systems were selected both on AHU and roof top units, with a continuous monitoring of the internal air quality. Stefano Venturini, Project Manager at Panzeri SpA says: «Nowadays technological systems play an important role in buildings, even contributing to enhance their economic value. On the other side we have to consider both investors and end users, who now pay a great attention toward comfort and proper air treatment, than in the past, when they were considered secondary aspects».